« Happy Belated Birthday to My Dad! Wow! I just love this Build-a-Bear stuff! Stamps, die cuts, embosslits… They are all so much fun! When I saw this week’s color challenge at Pals Paper Arts I knew it would work perfectly with the boy bear. Then of course came the question — do I make one on the Big Shot, or use the stamps? Oh the dilemmas! I was more in a mood to color, so I chose the stamps. I used my Stampin’ Write markers to get nice bright colors. Of course I had to add some Creamy Caramel for the bear. I love how it came out! These are fabulous colors together! I like what you did with Mr. Bear. I’m glad you used the stamp. I love the feel of stamping onto paper much more than die cuts. (Although I like those, too!) Thanks for playing at PPA! Oh too cute! I am kicking myself because I haven’t order any of the Build-a-Bear things yet! I love what you did with this stamp! You did such a great job with these colors! Thanks for playing @ PPA! Oh So CUTE!! I love these Build a Bear stamps. Didn’t think I’d want them, but after seeing so many cute things done with them…I think they are going to have to go on my list! GREAT JOB! 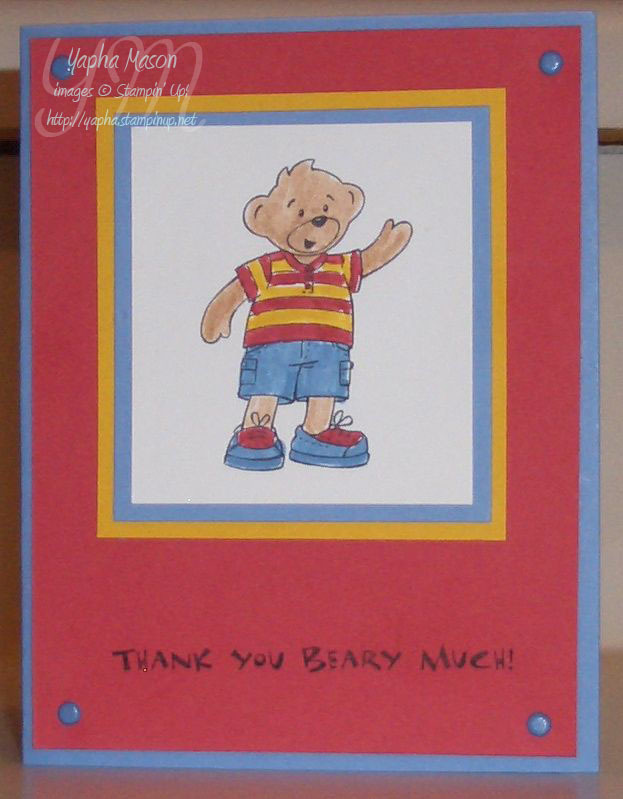 I love your Build-A-Bear card, Yapha! Great job using the challenge colors, too! Thanks for playing along at PPA! I hope you’ll join us this Thursday for the next sketch challenge!